This time the spotlight will be shining on The Slaughter, a pointy and clicky murder mystery in Victorian London. Let’s see if we can’t help it escape the cold emptiness of Greenlight limbo, eh? A serial killer is terrorizing the streets of Victorian London, and private investigator Sydney Emerson has hit a new low between finding lost dogs and receiving alleyway beatings. A turn of events sees Sydney forgoing his selfish nature and thrusting himself into perilous and increasingly surreal situations, walking the line between dreams and reality. I really wish more video games took place in Victorian London, horror-ish adventure or not. This one does though, and in it, you’ll be playing the part of one Sydney Emerson, pointing and clicking him through “slums, taverns, opium dens and even Sydney’s dreams and hallucinations”. 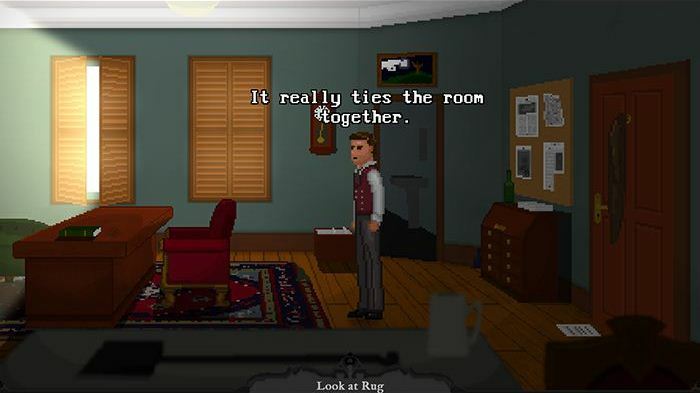 Uh… ah, of course: its creator describes the game as “Blue Velvet meets Monkey Island”. Well, guess that last bit will end up making sense… somehow. Oh and on top of investigating leads and looking for clues, you’ll also have to manage Sydney’s state of mind, as conversation options will change depending on his mentality. Yup. So riddle me this, dear reader: why is The Slaughter still struggling to get through Greenlight? It’s not out just yet, but should be soon-ish! As such, might I recommend visiting its Greenlight page and handing over a ‘yes’, if you like what you see? Remember: your vote matters!